Ratio of the flag: 2:3 - 2:3,5. Ratio of the vertical hanging flag: 2:3 - 2:5. This flag appears at Dr. Sz�ll S�ndor: V�rosaink neve, c�mere �s lobog�ja (1941) as "P�cs, Baranya Co.". 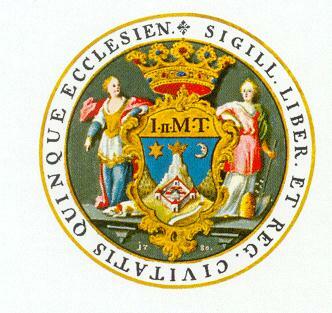 P�cs city - "The CoA of the city is a shield divided three parts with gold outline. The gold bastion like top field relates to the past, the dark blue middle field relates the historical monuments of the city. The bottom arched black colour is the symbol of the mining, the red hammer is the symbol of the industry, the crossing book is the symbol of the science and the school city." P�csi Tudom�nyegyetem - It was founded at first in 1367 by King Louis (the Great). Vertical and horisontal flag can be found at http://www.univpecs.hu/marketingosztaly/arculat/arc6.pdf.